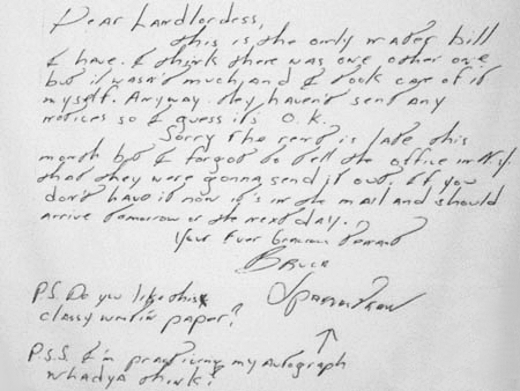 Early-1975, just months before the release of Born to Run — the breakthrough album that would see him almost immediately catapulted to mega-stardom — Bruce Springsteen was hand-writing apologetic notes to his "landlordess," Marilyn Rocky, due to late rent payments. The autograph practice was soon put to good use as, according to Marilyn, by August of that year the house in Long Branch, New Jersey, "was under siege" as a result of her tenant's newfound fame. Transcript follows. Image courtesy of Terry Burr.